OTTAWA - Prime Minister Stephen Harper is getting more blank space on his canvas to draw up a new cabinet, as the number of departing ministers rises. A major shuffle is expected this month and will include the people Harper wants to be standard-bearers for the policies the party will take into the 2015 election. The prime minister has asked his caucus to let him know their re-election plans as he considers who will get seats at the cabinet table. Marjory LeBreton, government leader in the Senate, said Thursday she's giving up her post. Diane Ablonczy, minister of State for foreign affairs, said she won't run in 2015. Earlier this week, Ted Menzies, minister of state for finance, said he won't run again. Last month, Fisheries Minister Keith Ashfield asked to be relieved as he fights cancer. Public Safety Minister Vic Toews is also expected to retire, but he has not yet made a formal announcement. All this leaves significant space for Harper as he rearranges roles and brings in new faces. Calgary MP Michelle Rempel and Ontario's Chris Alexander, both parliamentary secretaries, are among the names often raised as potential candidates for promotion. And the prime minister is already signalling one structural change to the cabinet as a direct response to the Senate expense scandal that is dogging his government. 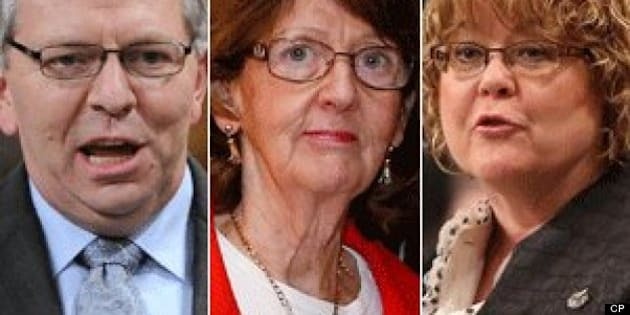 Whoever replaces LeBreton as the government leader in the upper chamber will not be a member of the cabinet, a government source said on condition of anonymity. The government has recently amped up its rhetoric on bringing in an elected Senate. "The next Senate leader will not be a member of the ministry, so that would leave us with a 100 per cent elected cabinet," said the source. LeBreton, 73, is only two years away from the Senate retirement age. She said she would stay on until then as a Conservative senator for Ontario. A former appointments director and deputy chief of staff to Prime Minister Brian Mulroney, LeBreton was named to the Senate in 1993. "I intend to step up my efforts in support of meaningful Senate reform and also actively back the new strengthened rules we introduced regarding Senate expenses," she said in a statement. LeBreton was the government's main spokesperson in the Senate throughout the controversy over improper expense claims. Harper issued a statement thanking LeBreton for her services. She was an adviser to Harper on campaigns as well as on Parliament Hill. "From our first day in office through to today, Sen. LeBreton has contributed her wise counsel, exceptional work ethic and unrivalled institutional knowledge and in so doing has made a tremendous contribution to our government." Ablonczy is a veteran of the Commons. One of the first wave of Reform party MPs elected in 1993, she participated in the full evolution of the Conservative party. In 2002, she ran for the leadership of the Canadian Alliance against Harper and was one of the first voices to support a merger with the Progressive Conservatives. Portions of Ablonczy's riding of Calgary Nose Hill are going to become part of a new riding, Calgary Rocky Ridge, for the 2015 election. This has prompted questions about her re-election plans. She said she had initially intended to announce her decision next year. "However, since some of my colleagues have recently announced that they will not seek re-election in 2015, the questions are becoming more insistent,"Ablonczy said in a statement. "That puts me, my family and my staff in an uncomfortable position. I therefore think that, especially since others beside myself are affected, this is the appropriate time to announce that after serving 22 years I will be leaving the political arena in 2015."